Bout #2 featured 20 year-old Jose Vigil (132 lbs.) 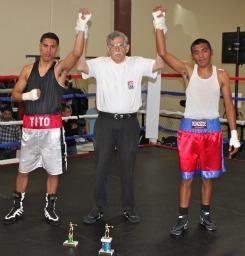 of North County Boxing with 10 amateur bouts under his belt going up against 19 year-old Jorge Ruiz (130 lbs.) from the Alliance Training Center in Chula Vista, CA. who’s had six amateur bouts. If you were to score this match in the pro-style, Ruiz took the first round by continually tagging Vigil from a distance. Then in the second round the momentum switched and Vigil, the brawler, started getting in close to deliver his damaging shots to the head. Before long Ruiz’s nose was bleeding and a standing eight count was issued. Since the third round would decide the match, both boxers came out banging. Before long Ruiz exhibited signs he was tiring and Vigil took full advantage. Bout #3 featured nine year-old Carlos Sanchez (69.8 lbs.) 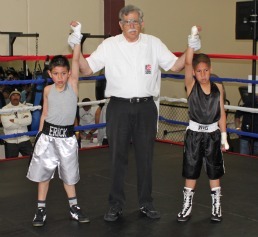 of the Alliance Training Center and eight year-old Erick Gazca (65.2 lbs.) of Sparta Boxing. 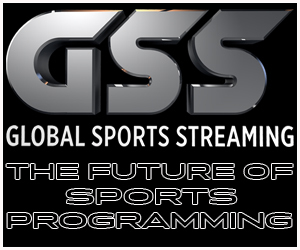 Even though Gazca was game and kept pressing the action, he was no match for the power and superior boxing skills of Sanchez who benefitted from being longer in the gym and having the five pound weight advantage. Bout #4 featured nine year-olds Alan Ramirez (83.8 lbs.) of Rhino Boxing and Agustin Alarcon (84.4 lbs.) of the Indio Boxing Club. Alarcon employed two tactics, one, an amusing mannerism of stomping his foot as he did each head fake and the second involved pinning Ramirez in the corners. To his credit Ramirez paid little attention to the head fakes and when trapped in a corner managed to fight himself out with his more accurate punches. 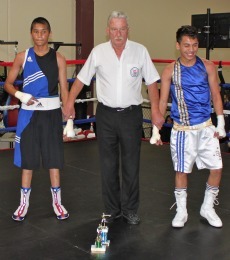 Bout #5 featured 13 year-olds Jesus Balderas (113.6 lbs.) of Penacho facing Moises Lopez (106.8 lbs.) 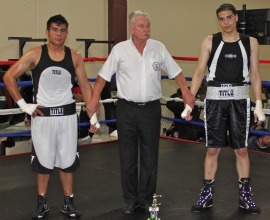 of Baja California Boxing in Mexicali. The difference in the skill level between Balderas (the more experienced boxer) and Lopez was evident. However, there was no quit in Lopez who stood there and made the best of the lopsided exchanges. After each round Balderas went out of his way to touch gloves and show respect for his opponent’s valor. Bout #6 involving 14 year-old Ernesto Verdin (109.4 lbs.) of Baja California, Mexicali and 13 year-old lefty Luis Enriquez (109.8 lbs.) of the National City CYAC was certainly a strong candidate for match of the day. In round one the fireworks started. The round was so hotly contested you couldn’t pick a winner. Round two went to Verdin who not only worked over the body, he caught Enriquez twice on the chin as he was backing up. Verdin became so tenacious it was as if Enriquez had taken food off his family’s table. At one point he tried to turn the match into a no holds bard brawl and wound up to deliver a bolo punch. Even after the final bell sounded the punches kept coming. Even though Enriquez had the better technique, Verdin was in better condition. 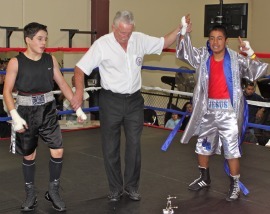 Bout #7 featured 14 year-old Andres Cortes of Escondido (118.4 lbs.) 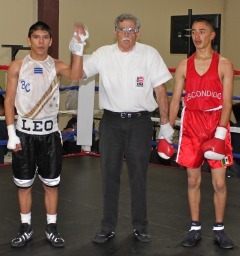 versus 15 year-old Leonardo Baez (119 lbs.) of Baja California, Mexicali. Again the boxer from south of the border had more energy, was one year older and had much more experience in the gym. Baez led off the bout with a punishing left hook that backed Cortes into a corner. Soon after a standing eight count was issued. Immediately following that skirmish Baez pinned Cortes against the ropes and flailed away. When approached later by his family and friends, Cortes was visibly upset. 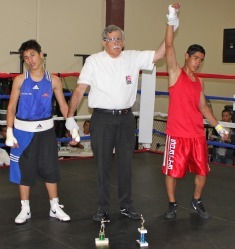 Bout #8 featured 16 year-old Carlos Geraldo (111 lbs.) of the National City CYAC who had 5 Bouts under his belt going up against Marcos Lau (117.4 lbs.) of Sparta Boxing. Lau was a late substitute for Edwardo Baez from the same gym. Lau took the opening round by showing more energy and better lateral movement. Lau’s ferociousness helped him overcome his lack of boxing technique. Round two would be scored an even round. Early in the third round, Lau was admonished for his dirty tactics and hitting on the break. Lau kept advancing on Geraldo with the old one, two combination of jab followed the straight right. He never took a step back to win the match going away. 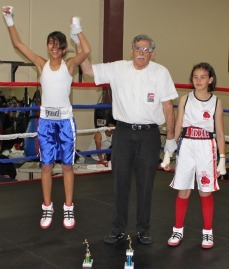 Bout #9 featured 11 year-old Andrea Medina of the Gutierrez Gym located in South San Diego. She had nine bouts under her belt. She faced 12 year-old Julie Muñoz of Sparta Boxing who’s had seven bouts. Muñoz ended up winning the match by being more aggressive with her attacking in and out style. It took Medina well into the third round before she could mount an attack of her own. 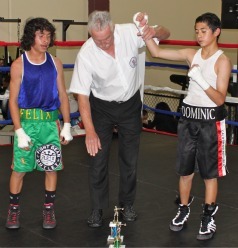 Bout #10 featured 12 year-old Dominic Serna (89.4 lbs.) 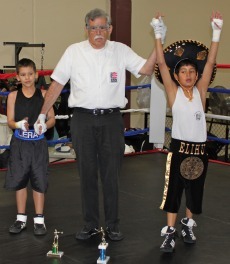 of Indio Boxing facing 13 year-old Felix Verdin (90.8 lbs.) 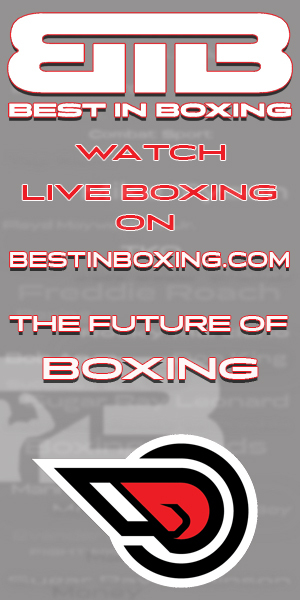 from Pacific Coast Boxing. Again, despite their ages, there was a big disparity in the boxers’ skill levels, as it had been reported that Serna had had 40 bouts and Verdin just 12. From the opening bell, Verdin, the smaller of the two, tried to work himself inside. That strategy didn’t work on Serna who kept tagging Verdin and then moving laterally to keep his distance. Serna’s performance in this action packed bout was later recognized when he was named one of the top boxers of the show. 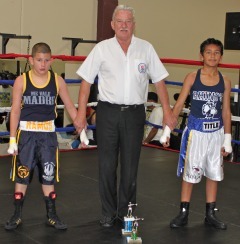 Bout #11 had 11 year-old Diego Molano (89.4 lbs.) 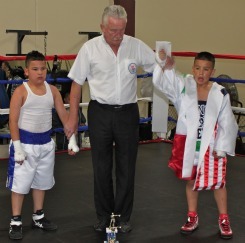 of Rhino Boxing going up against 10 year-old Reymond Ramos (85.6 lbs.) of the Undisputed Fitness and Training Center in North Park a section of San Diego. Even though Ramos pressed the action and made it difficult for his opponent, Molano was the consummate boxer and landed more of the accurate blows, enough to win over the judges. Bout #12 featured 17 year-old Carlos Adams of the Alliance Training Center of Chula Vista going up against 18 year-old Manuel Vasquez of Chula Vista Boxing. With expert boxing help in each corner this was one of those duels between boxing clubs less than two miles apart. The tall, slender boxer (Adams) took control early over the stocky brawler (Vasquez). Before long the relentless pressure by Vasquez got him in close and he began landing the short rights and lefts to take over control of the match.